T&C heads to Nova Scotia - where the landscape forces your eyes open and your heart forward. Editor’s note: Our correspondent Don Enright – the same guy who brought us Reeling with Memories in Manitoba and An icy “affaire de coeur” from Quebec – is back on our pages, only this time with a post on Nova Scotia. We love the fact that Don, like us, has a massive crush on Canada. 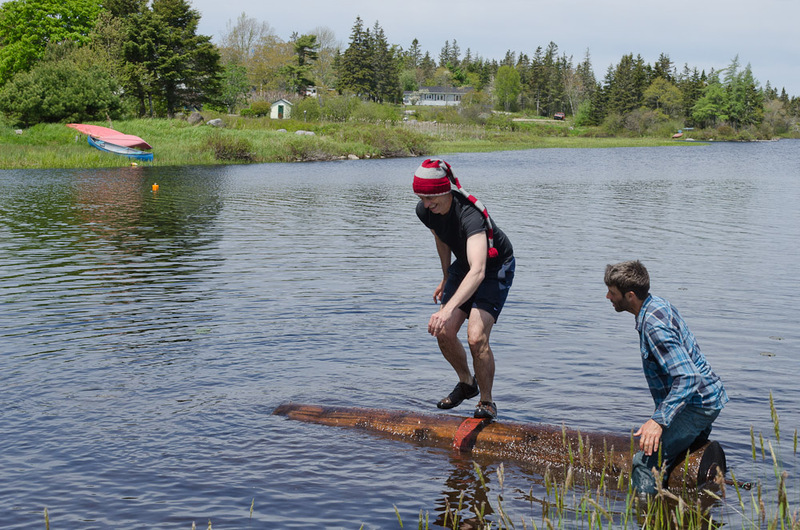 And we especially love this shot of him log-rolling with world-renowned lumberjack Darren Hudson. What did he say about this great Canadian pastime? “You know how everyone thinks it’s really, really hard to do this? Well, it’s actually much harder than that!” Thanks to our partners in tourism, who did not review or edit this story before publication, for supporting our writer. I fell in love in Nova Scotia many years ago. I was young, and my heart was an open book. I didn’t want to succumb, but there I was, head over heels, smitten with a landscape and a language and the people who spoke it. For eight months our affair lasted, as I hiked the Bay of Fundy shores on the weekends and buried my head in blissful study during the week. And like so many love stories, this one ended in separation, longing and, ultimately, forgetting. My fortunes brought me from my hometown in Calgary to Canada’s other coast, where the work was, and Vancouver has been my home ever since. When I remember Nova Scotia, what comes back most vividly is the taste of seafood. We didn’t have it growing up. As Calgarians, our Friday fish dinners (Catholics, you know) meant trout and pike caught up north. But at Nova Scotia’s Université Sainte-Anne, where I lived and studied French among the Acadians, they served up fruits de mer in the cafeteria like hotdogs. I remember the first time I had pétoncles, dished out from a big steam tray. I didn’t even know what they were. I remember calling my mother and telling her about these fantastic pétoncle things. How was I to know they were scallops? I was the proverbial kid off the Alberta turnip truck. And now I’m back in the province that opened so much of the world to me. Back for a five-day, seafood-stuffed tour of her sea-bound shores, driving from Lunenburg down to Yarmouth and back up to Wolfville. Let the mountains, dark and dreary be, at least for now. Nova Scotia’s southern shorelines have treasures enough. DAY 1 – On Canada’s West Coast I’ve grown accustomed to black coastlines, grey skies and deep-green forests. Now, as I stand on the shores of White Point Beach Resort south of Lunenburg, my eyes adjust to a whole new palette. White rocky beaches are everywhere, and the sparkling, foamy blue Atlantic comes thundering in, backlit by dazzling spring skies. It’s bright, exhilarating. I remember this feeling: the Maritimes force your eyes open, your heart outward. DAY 2 – I travel south to the Barrington River in search of more adventure, and find it in the person of Darren Hudson, world-champion lumberjack. Here, beside the local millpond, he gives visitors a taste of the lumberjack life he loves, and it is spectacular. I try my hand at paddling a molasses barrel (difficult), axe-throwing (difficult) and, of course, birling or log-rolling (insane). Darren is a master of it all, and to see his agility and grace on the river is astounding. After the demonstrations, he takes me to his small smoke shack where he has been curing “kiack” or river-run herring. We grab a few and sit in the sun by the river, peeling back the crispy skin to find the good stuff between the little bones. He tells me of his dream of bringing school children in to let them experience their own Nova Scotia heritage, to show them the simple life his family has known here for five generations. Seems like a pretty sweet dream. Onward I drive, rounding Nova Scotia’s southwestern tip and heading northward to the French shores, the land that captured my heart so long ago. I walk along the pier in Pubnico, hoping to catch the local accent, and I eavesdrop on three fishermen having a good-natured argument about how to install an engine part. I stop in for seafood along the pier but the server addresses me in English. Clearly, I’m from away. I overnight at The MacKinnon Cann Inn in Yarmouth, an English bastion between the two French districts. My innkeepers, Neil Hisgen and Michael Tavares, have converted a big old mansion into a series of fantastic rooms, decorated by decade. I stay in the elegant 1910s room, but next time I will have to try the 1950s suite, decorated to Lucy-and-Desi perfection with separate twin beds. The buzz in Yarmouth is all about a historic church that has just been demolished. I had passed its still-settling ruins driving into town. My hosts are enraged; for three years they tried to save it. “When you lose your built heritage, you become just anywhere,” Michael says. Too true. DAY 3 – The next morning, I make my way along the Baie Sainte-Marie under perfect blue skies. The years have been good to the region: huge old wooden houses are freshly painted, strung in narrow strips along the coast, Acadian-style. Stopping at a bakery, I take the initiative to speak French, and the proprietress reciprocates in the beautiful (and difficult) accent I remember. I pass by my old campus, Nova Scotia’s sole French-language post-secondary, and discover it too has fared well. Solar panels adorn my former residence, and shiny new buildings have popped up here and there. I want to stay, to walk to the old lighthouse, to find all my old haunts but, alas, I have a ferry to catch, and a date with some whales. Whales don’t like to be kept waiting. Digby Neck is the long stretch of land that separates St. Mary’s Bay from the Bay of Fundy proper, and it’s here that Tom Goodwin has been operating Ocean Explorations for the last 30 years or so. He’s a biologist by training, and he knows these waters and their marine life like nobody. It’s his first whale-watching trip of the year, and he and his wife Penny are busy sprucing up the place, patching up after the tremendous storms of this past winter. Over the water we race in his Zodiac, but things are quiet. I’m happy just to be out on the water on this glorious day. Tom’s not the type to give up easily, and after a good long while he triumphantly shouts, “There!” A minke whale has just surfaced. Tom has a good eye: minkes (rhymes with stinkies) don’t make a water spout when they surface and their small, sleek shapes are difficult to spot. This one disappears after a moment, and I’m thinking this is going to be a pretty slow day on the water. But then the minke pops up right by our boat, surprising us with the sudden sound of psshh! from its blowhole. It surfaces a number of times, always in a circle around us, and we whoop with delight. It’s curious about us. Tom says he has mixed feelings about that; he’d be happier if the whales kept their distance, for their own safety. But I snap dozens of images with my telephoto, my hands shaking. That evening, while checking into Garrison House in Annapolis Royal, I mention my interest in Acadian history and my hostess suggests I take in the candlelight graveyard tour across the road from the beautiful Fort Anne National Historic Site of Canada. I don’t need much convincing. Fort Anne and its sister site Port Royal represent some of the most hotly contested land in Canadian history, having changed hands at least seven times over the centuries. After a hearty dinner of Digby scallops, I walk over to meet Alan Melanson, a 10th-generation Acadian, who hands us our lanterns and leads us from headstone to headstone, weaving tales of soldiers who lived miserably and their wives who died young, of politics and intrigue and the endless grim realities of war. History is long and bloody in Nova Scotia. I don’t think I know a 10th-generation anybody back home. DAY 4 – The next morning dawns bright and sunny, and to lighten my mood I head to Hall’s Harbour where a lobster adventure awaits. Sure, you can get decent lobster in most restaurants. Better yet, you can drive down the steep coast to this tiny village, choose your lobster from the pens, take it to the kitchen and get a hands-on intro to the lobster trade while your lobster cooks to perfection in water from the bay. My guide, Lowell Simpson, uses live lobsters to show me how they are sized and hand-selected from the traps. He has a 16-pounder (a market lobster weighs one or two) and it crushes the mussel shell Lowell places between its pincers. Impressive. The lobster lunch is, naturally, outstanding. To think that 100 years ago, lobsters were dismissed as poverty rations and fed to prisoners. That evening, in Wolfville, I find room for one last seafood repast. Chef Sean Laceby of the Blomidon Inn serves up the finest halibut I have ever had. Surely halibut is the aristocrat of all fish: rich, tender, flavourful, filling. The trick, his brother (and hotel manager) Michael tells me, is to wait until they’re running in the bay; you need to have it fresh. I eat until I can eat no more, and head to my room to prepare for tomorrow, and my ultimate adventure. DAY 5 – I am to end my Nova Scotia reunion the way I began it: immersed in the salty deep. But this time, I’ll be tidal-bore rafting on the beautiful Shubenacadie River. I have never seen anything like it: this river is wide, gorgeous, meandering, tame, placid… for most of the day. You hop in your Zodiac and gently bob along, calmly watching the eagles go by as your guides lead you toward the mouth of the river. The Bay of Fundy has the largest tides in the world at 12 to 15 metres, and when the tide turns, it all comes rushing in. Within minutes, the quiet Shubenacadie becomes a churning, boiling nightmare with standing waves taller than I am – and I’m tall. Our guide takes endless delight in crashing our vessel straight into thick of it. We get soaked, and soaked again. That evening, all by myself in a tiny guest cabin beside the Shubenacadie, I sip local wine, listen to the ovenbirds sing and reluctantly pack my bags for my journey home. Sometimes, I suppose, a few years’ separation is just what you need to appreciate what you’ve missed. Until we fall in love again, Nova Scotia. Great article! I’m so happy you went on the graveyard tour with Alan Melanson but it’s too bad you didn’t make it to Port Royal. His identical twin brother, Wayne, works there as an interpreter and they have a great time confusing people who say “I just saw you at the other fort”! I hope your article will entice other Canadians to come visit our famous Fundy shore. Great food, award winning wines, the highest tides in the world, whales, history, and a relaxed pace of life. What more could you want? I could go on and on, and have been known to! Glad you enjoyed yourself! Oh Don, you were in my back yard … my stompin’ grounds! I sooo enjoyed this story. But you must must MUST come back. I can keep you busy for a couple more weeks seeing and doing “wow” things. Canoeing in the wilderness, making rapure (rappie pie … did you have any of that disgusting looking but oh-so-tasty dish when you were at St. Anne’s?) + great tour to the Tusket Islands (and hilarious stories). Acadian kitchen parties. Lobsters cooked and served 10 different ways. I also know secret places to find Nova Scotia Agate and Chanterelle mushrooms. Open invitation including a place to park your bones. What a wonderful, diverse corner of Canada you live in. Hi, Don. I’m smitten with this piece and I’m not from Nova Scotia. How well you brought to life the people and the place. I remember, too, the first time I had a scallop burger. Even though I was a kid from Sask., I loved it.